Fortune and success are calling your name personally, but I don’t suggest you send out a press release. Rather, impress others with how genuinely concerned for their wellbeing you are and make sure there are no little cracks in your reputation. If you find any, make sure you take care of the repairs with deeds and not just with words. 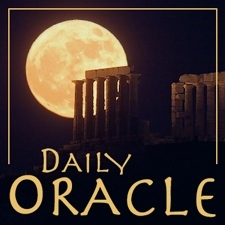 Today’s Oracle takes us to the Scorpio weekly for July 22, 2005. Fortune and success are calling your name personally, but I don’t suggest you send out a press release. Rather, impress others with how genuinely concerned for their wellbeing you are and make sure there are no little cracks in your reputation. If you find any, make sure you take care of the repairs with deeds and not just with words. The world needs leaders who can hold a vision and certainly you qualify. But more in tune with the times is a need for leaders who are capable of setting a good example. This way authority and recognition will work for you and not against you.